(Nanowerk News) The world’s first robotic dog simulator for veterinary training has evolved into the opening of a new simulation center at Cornell University’s College of Veterinary Medicine. Cornell’s new simulation center includes two fully equipped exam rooms, two rooms for live video-feed observation and debriefing, and space for storage and developing new models, such as a new robotic cat and a more advanced dog. Veterinary students conducting a simulated emergency exam on a robotic dog. In the 10-minute simulations, a small team of students collects basic patient info from the robotic dog or cat, then assesses, plans and treats. The students can use a full crash cart, medical supplies, defibrillator and other tools to take the robo-pet’s pulse, listen to heart and lung sounds, insert catheters and hook up monitoring devices to get feedback orchestrated through special software. Others watch in the observation room, then all meet in the debriefing theater to watch recordings and debrief. The center is part of a greater plan to form a clinical-skills complex: a self-paced multi-station lab open 24/7. Students will have access to direct hands-on practice with such basic skills as suturing on skin models or putting catheters into fake limbs before labs or clinics. First-year students now practice listening to heart and lung sounds on the robo-dog and cat. Second and third-year students started performing scenarios in required core classes this year. Students role-playing with actors in the required client communications class now get a mock patient thrown in the mix. They take cases from start to finish and juggle assessing a patient while communicating with technicians, clients and other clinicians in the same room. Preparing to expand the learning model further, emergency and critical care specialist Gretchen Schoeffler and an emergency and critical care resident, will attend formal trainings on running simulations before offering a new course in spring 2013 and then evaluating simulation-learning effectiveness. Meanwhile, Fletcher is developing new simulation-based tools for the clinical competency assessments students must complete before earning a DVM. Fletcher has brought his robo-dog to schools across the country and world. He is now building a more advanced model code-named “Butch.” Butch will run with inexpensive, off-the-shelf electronic components and sports a more realistic airway, a soft abdomen compartment, articulating joints, more areas for catheters, more space inside the body and a more realistic overall feel. 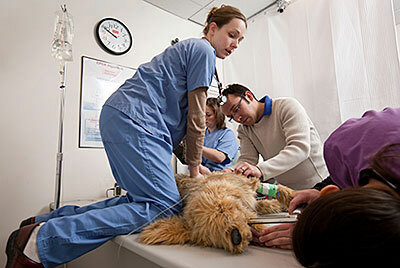 Fletcher and collaborators are working on a new simulation toolkit for veterinary education. It will include an open-source software platform with affordable hardware that can be shared with other institutions interested in introducing simulation teaching. It is slated for release in spring 2013.